Recent college graduates may not realize that a reason for their faltering careers could be because they have been “hamstrung by their lack of learning” in school. But deciding how to assess what they learned in college is not straightforward. A follow-up study from the authors of “Academically Adrift,” a book that showed how “many students experience ‘limited or no learning’” in college, tracked the same students into their lives after graduation. As part of the original study , students had taken the Collegiate Learning Assessment (C.L.A. ), “a test of critical thinking, analytic reasoning and communications skills”. Even after statistically controlling for students’ sociodemographic characteristics, college majors and college selectivity, those who finished school with high C.L.A. scores were significantly less likely to be unemployed than those who had low C.L.A. scores. The difference was even larger when it came to success in the workplace. Low-C.L.A. graduates were twice as likely as high-C.L.A. graduates to lose their jobs between 2010 and 2011, suggesting that employers can tell who got a good college education and who didn’t. Low-C.L.A. graduates were also 50 percent more likely to end up in an unskilled occupation, and were less likely to be satisfied with their jobs.ge, they improved less than half of one standard deviation. For many, the results were much worse. One-third improved by less than a single point on a 100-point scale during four years of college. The C.L.A. has gained the support of employers who “say grades can be misleading and that they have grown skeptical of college credentials”. Even as students spend more on tuition—and take on increasing debt to pay for it—they are earning diplomas whose value is harder to calculate. Studies show that grade-point averages, or GPAs, have been rising steadily for decades, but employers feel many new graduates aren’t prepared for the workforce. Over a hundred colleges participate in CLA+, a test-based program that enables graduates to prove their skills to potential employers. Some schools like California Polytechnic State University promote this test for its benefits to individual students, while other schools focus more on the CLA+ an assessment that shows the overall return on value they provide. Purdue University President Mitch Daniels is in the middle of a battle having to do with the CLA+ at his school. Two years into the job, Daniels has arrived at a major impasse with Purdue’s faculty: how to prove that students are actually learning something while at the university. Backed by Purdue’s Board of Trustees and inspired by the work of Richard Arum and Josipa Roksa (the authors of Academically Adrift: Limited Learning on College Campuses) and others who argue that undergraduates aren’t learning crucial critical thinking skills, Daniels says the university must be accountable to students, parents, taxpayers and policy makers. He’s tasked a faculty body with choosing just how Purdue will assess gains in critical thinking and other skills after four years there, and he wants to start the assessment process soon — by the fall. The CLA+ is not free of controversy. … A 2013 study, for example, found that student performance on such tests varies widely based on motivation for taking the test. In other words, a student who has no reason to do well on the test might not take it seriously, and therefore can skew the results negatively for the institution. Others have questioned the appropriateness of basing assessment on small groups of students and whether the gains are likely to be notable at a university like Purdue that admits well-prepared students. The most popular comment from the Purdue article made a good point. Yes. It is time that universities and colleges follow the NCLB model on testing because it has worked so well…. Kevin Carey, “The Economic Price of Colleges’ Failures”, New York Times, September 2, 2014. Douglas Belkin, “Are You Ready for the Post-College SAT?”, Wall Street Journal, August 25, 2013. Colleen Flaherty, “Test Anxiety”, Inside Higher Ed, January 28, 2015. With college, it’s particularly important to finish what you started because “A Bit of College Can Be Worse Than None at All”. Americans have flocked to colleges in unprecedented numbers in the last half-decade, fueled by a conviction that postsecondary education is the surest route to steady employment and higher salaries.Yet those who begin, but don’t complete, a degree are learning the hard way that the payoff is in finishing—or that they might have been better off not attending college at all.The number of students who don’t complete college is growing. Nearly one-third of students who started college in 2012 didn’t return to a U.S. school the following year, according to the National Student Clearinghouse Research Center. And a new report out from a group of higher-education organizations found that roughly two-thirds of students who return to school after interrupted courses of study still don’t graduate. Those students may find themselves doubly damned: cut out of consideration for professional-track jobs, and starting their careers years behind their peers who entered the workforce with just high-school diplomas. Many have student loans to boot. A degree is an important marker for employers seeking workers who have demonstrated “perseverance and persistence”. When a degree was still a relative rarity, any college experience helped a candidate stand out. But postsecondary education is now the norm for enough people that a short stint in college is no longer a positive differentiator, says Anthony Carnevale, a labor economist who runs Georgetown University’s Center on Education and the Workforce…. High school graduates should consider these factors before they rush into enrolling for college, especially if they are poorly prepared academically or need to borrow substantially. The bottom quarter of earners with a college degree don’t make more money than the average high school graduate. And this hasn’t really changed much in 40 years. 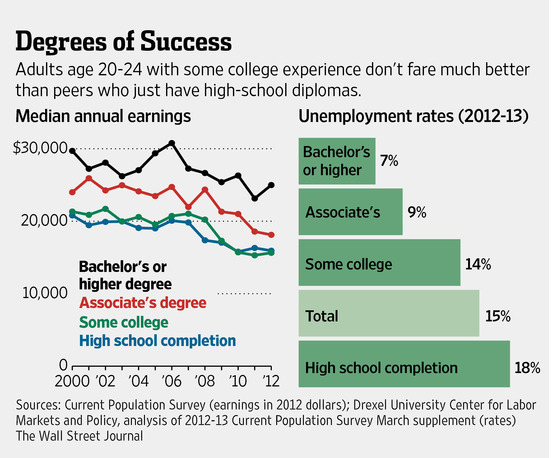 This chart may explain why “college isn’t for everyone”, but additional considerations are important. … First, we don’t know for sure how much money this bottom quarter of degree-holding earners would have made without their college education. Furthermore, much of this could boil down to career choice: there are many jobs that require a degree but don’t pay very well. If someone earns a degree for reasons beyond making more money, it could be that the upfront investment is worthwhile regardless. “On ‘average’, it’s still worth going to college”, but be careful about making personal decisions on the “average” case. In the meantime, students who are unsure of what they want to study or do are probably best advised to be very cost-conscious when choosing a college, and to be unafraid to wait until they are sure how they will use their degree before they start to pursue one. 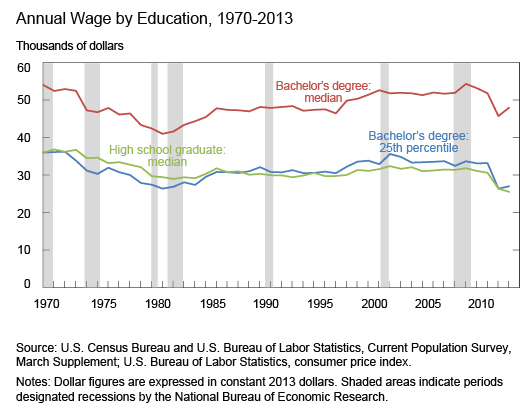 Chris Matthews, “Why college isn’t for everyone, explained in a single chart”, Fortune, September 5, 2014. Sarah Lawrence College has developed a way to assess the value it offers its students. 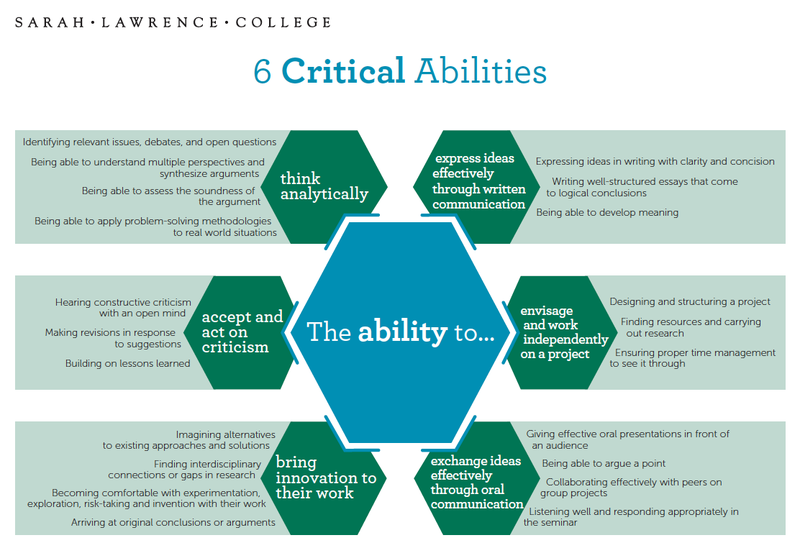 … The faculty came up with six abilities they think every Sarah Lawrence graduate should have…. Ability to think analytically about the material. Ability to express ideas effectively through written communication. Ability to exchange ideas effectively through oral communication. Ability to bring innovation to the work. Ability to envisage and carry through a project independently, with appropriate guidance. Ability to accept and act on critique to improve work. These measures serve as an antidote to the Obama administration’s upcoming rating system, which will measure things like cost, graduation rates, and salaries of graduates. Obama’s new system has generated controversy, particularly since poor scores could mean the loss of federal financial aid. Sarah Lawrence developed a “web-based assessment platform, designed to measure student performance against these critical abilities”. Advisors meet regularly with students to evaluate their progress. Students can learn if they’re getting “their money’s worth”. That’s a different measure of the value of an education than, say, student loan debt or earnings after graduation — the sorts of things the Obama administration is considering as part of its ratings plan. Students and parents are right to ask if they’re getting their money’s worth, says the college’s president, Karen Lawrence. After financial aid, the average cost of a Sarah Lawrence education is almost $43,000 a year. And they’re worried about getting jobs after graduation. But she says the abilities that the new assessment measures—critical thinking and innovation and collaboration—are the same ones employers say they’re looking for. I have a feeling every Sarah Lawrence graduate will be rated highly. The idea behind Sarah Lawrence’s assessment is laudable, but I must say I’m a bit skeptical about the way they measure student performance. Shouldn’t they have an objective third party doing the assessment? Amy Scott, “What do students actually learn in college?”, Marketplace, April 22, 2014.